The Congressional Budget Office's (CBO) long-term outlook shows debt reaching an all-time record as a share of GDP by 2034 and nearly doubling as a share of GDP over the next 30 years. A key driver of that increase is the growth in health care spending, which is projected to be the second-fastest growing category of spending after interest on the debt. 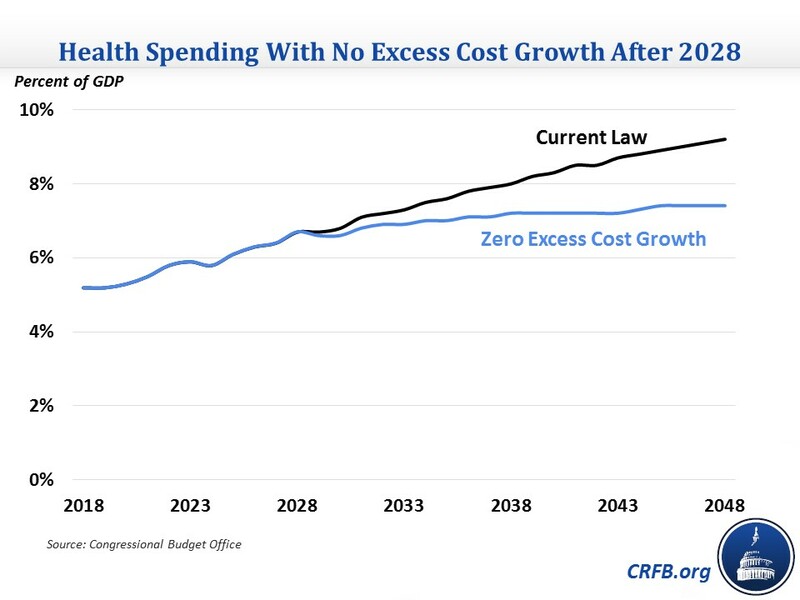 CBO's projection shows that controlling the growth of health care spending will be central to any effort to put debt on a sustainable path. CBO projects that total spending on Medicare, Medicaid, the Children's Health Insurance Program (CHIP), and the Affordable Care Act's exchange subsidies will increase from 5.2 percent of GDP in 2018 to 6.8 percent by 2028 and 9.2 percent by 2048. Most of this growth is in Medicare, whose spending net of premiums would double as a share of GDP from 2.9 percent in 2018 to 5.9 percent by 2048, but spending on the other programs would also increase from 2.3 to 3.3 percent of GDP in the same timeframe. Health care spending will go from being 27 percent of non-interest spending in 2018 to 40 percent by 2048. This growth in health spending is due to aging of the population and cost growth exceeding GDP growth. 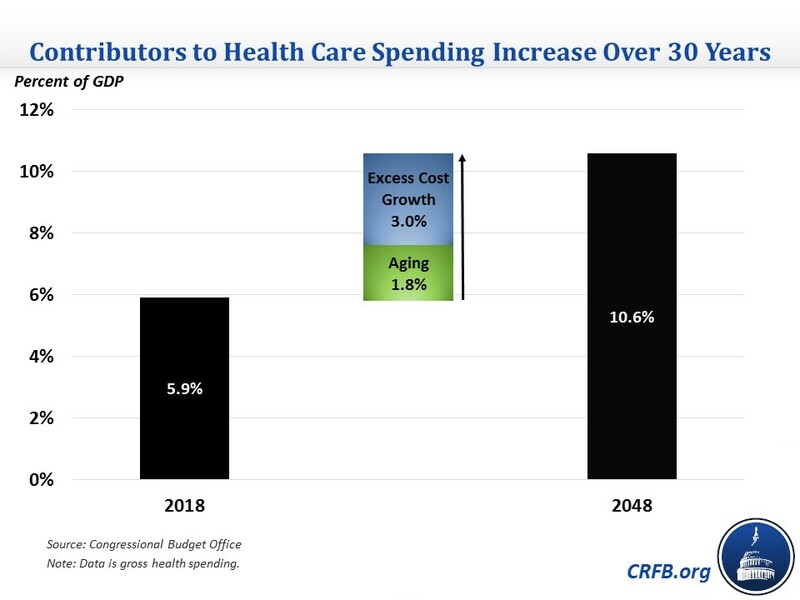 CBO estimates that gross health spending is 4.8 percent of GDP higher in 2048 than it would be in absence of aging or excess cost growth, with aging contributing 1.8 percent and cost growth contributing 3 percent. The aging of the population can be seen in CBO's projection that the 65 and older population will increase by 60 percent, from 53 to 85 million, over the next 30 years, while CBO's excess cost growth projections show both Medicare and the other programs having excess cost growth of at least 1 percent per year between 2029 and 2048. Not surprisingly, if excess cost growth were zero, health care spending growth would be much slower, though still sizeable. If that were the case after 2028, health care spending would increase more gradually from 6.7 percent of GDP in 2028 to 7.4 percent in 2048, rather than 9.2 percent in 2048 under current law. In that scenario, debt would be 20 percent of GDP lower in 2048 than the 152 percent projected under current law. 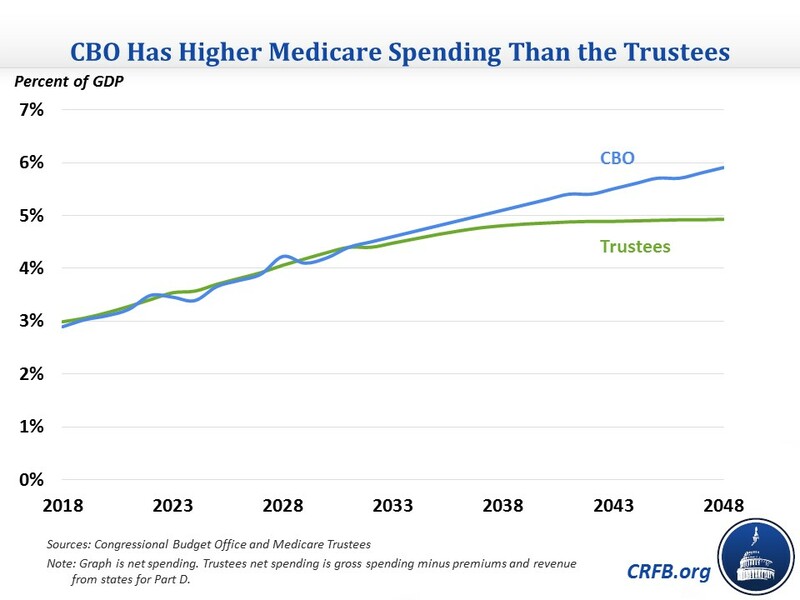 Compared to the Medicare Trustees, CBO projects that Medicare spending will grow more rapidly. The Trustees project that net Medicare spending will reach about 4.9 percent of GDP by 2048, with spending increasing only a small amount after that through 2092. By contrast, CBO's projection has Medicare spending reaching 5.9 percent of GDP by 2048, and if previous long-term projections that went out 75 years are any indication, Medicare would continue to grow similarly as a share of GDP after 2048. The main reason for this difference is the policy assumptions each set of projections make. The Trustees assume that current law payment policies will remain in place to hold down spending growth, while CBO effectively assumes that those policies would fade away after ten years, and spending growth would ultimately reflect underlying cost growth. As a result, CBO's ten-year projections are similar to the Trustees, but they diverge over time. Medicare's Chief Actuary questions the sustainability of these payment policies, and the Trustees produce an alternative scenario that rolls back these policies that has long-term spending projections more in line with CBO's. 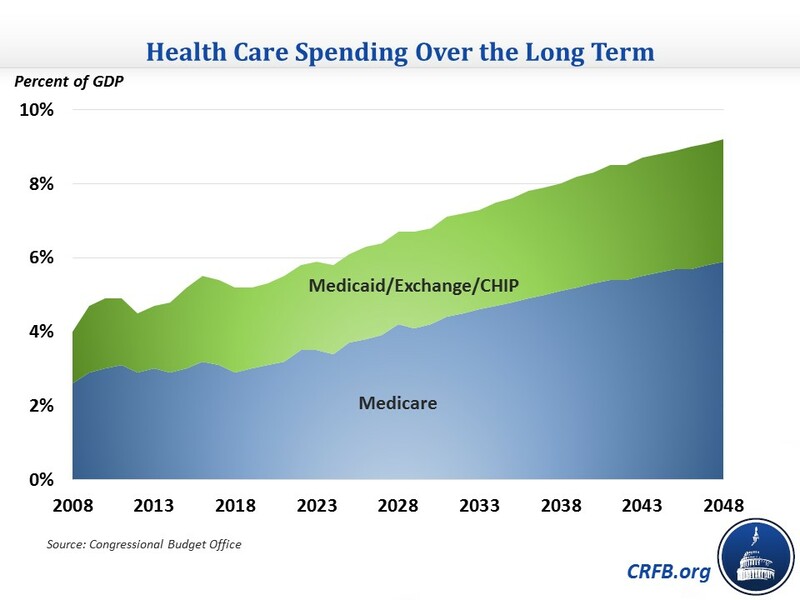 CBO's projections show that health care spending will grow significantly over the long term, driving up debt and crowding out other spending. Slowing the growth of this spending will be key to getting debt under control and being able to invest in other priorities.